In my opinion, most restaurants fall into a large category smack dab in the middle of awesome and terrible. Hence, it is highly subjective whether people like them or not. For me, the true test of how much I like a restaurant is if I go back shortly afterwards. This was surely the case when we headed over to The Little District after hockey. Previously, I was only able to sample 3 items off their appealing "Southern-inspired" menu and came away loving their deep-fried pickles. On the topic of Deep-Fried Pickles, I enthusiastically hyped them up to Emilicious, Sweet Tooth and Milhouse. Lionel Hutz, probably being pickled himself, wasn't overly excited to eat them... But for the rest, they were equally impressed as these turned out as good as last time. The firm, crunchy breading spiked with dill clung onto each house-made spear even after our initial bites. Pleasantly tart with only a purposeful amount of saltiness, these were appropriately accented by the spicy mayo. 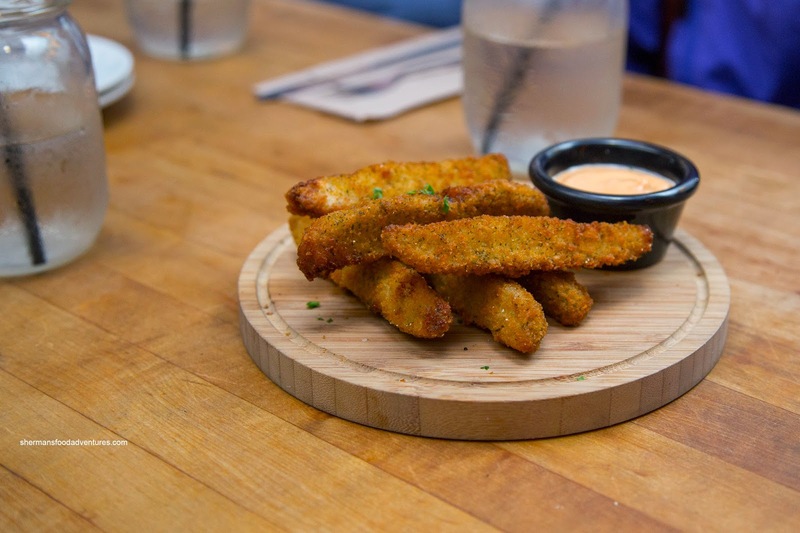 I'll go out on a limb and say these are the best deep-fried pickles in Vancity. 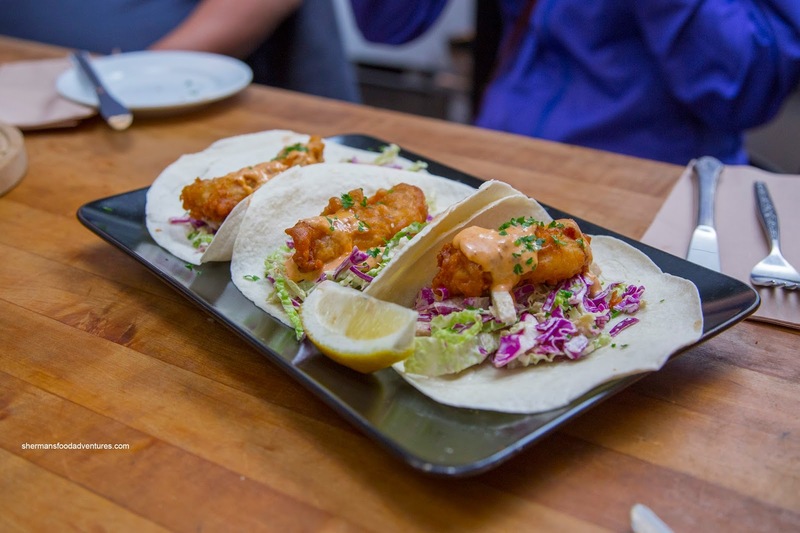 Onto another dish I tried last time, Sweet Tooth had the Fish Tacos featuring battered cod and apple slaw topped with Spanish paprika mayo. The cod was flaky and moist while coated with a lightly crispy batter. However, as with before, the amount of radicchio overwhelmed all of the other flavours where there was far too much bitterness. Emilicious had a hard time deciding what to order, so she ended up sharing 2 items with me (I wasn't complaining!). 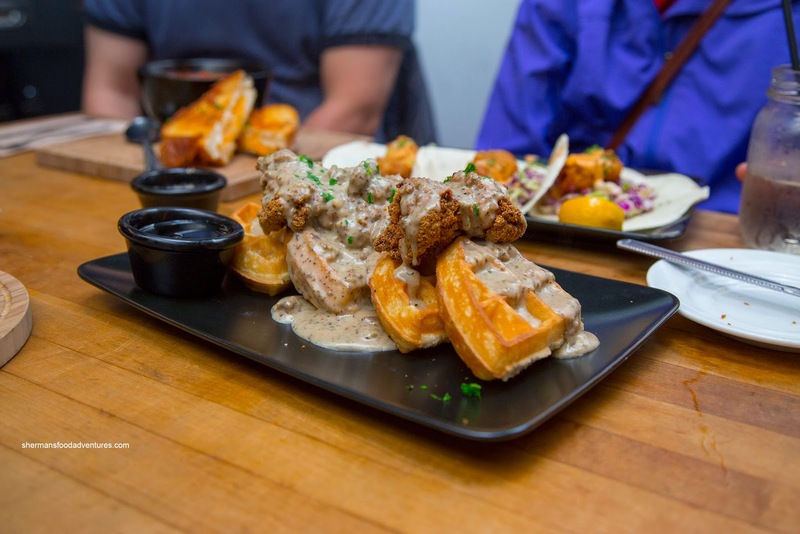 We started with the 2 piece Chicken and Waffle consisting of Southern fried chicken, country gravy and waffle. Oh man, this was one rich and sinful creation. I've had quite a few chicken and waffles in the past few years, but this one was on point. Beginning with the light and fluffy (a bit crumbly though) waffle, it was bathed in a spicy and full-bodied gravy with bits of sausage. The 2 pieces of fried chicken thigh were succulent and juicy with a crunchy batter that had proper adhesion to the meat. With a drizzle of syrup, this dish had the right flavours and textures. 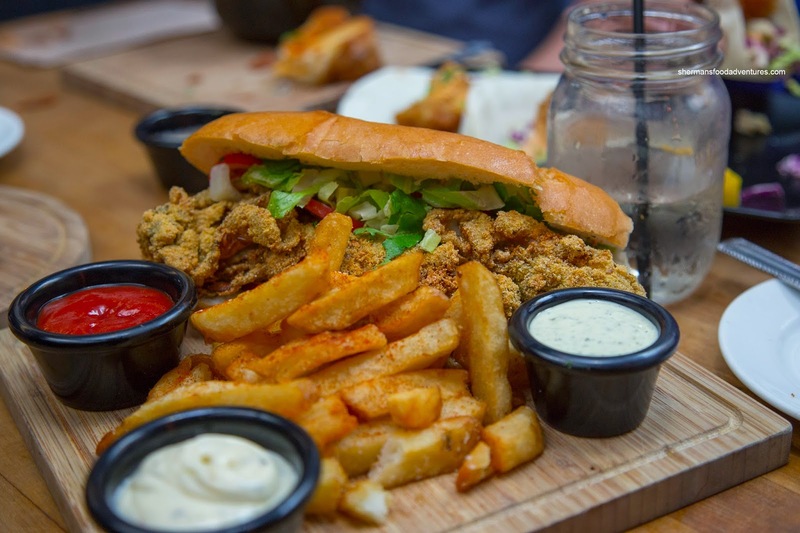 Next up, we tried the Oyster Po' Boy with friets. For $12.00, this was a significant amount of food. Within the soft and slightly crusty bun lay 3 plump large oysters that were cooked just right (juicy and not chewy) with a crunchy breading. The side of friets were lightly crispy and potatoey inside. Milhouse decided to go for the Tomato Soup & Grilled Cheese which we watched being prepared in the kitchen (we sat near it). It reminded me of the movie Chef where copious amounts of butter was used (a good thing!). Hence it turned out crunchy and buttery with ooey gooey cheese strings with each bite. As for the soup, it came in a bowl that was big enough to feed 3 people. 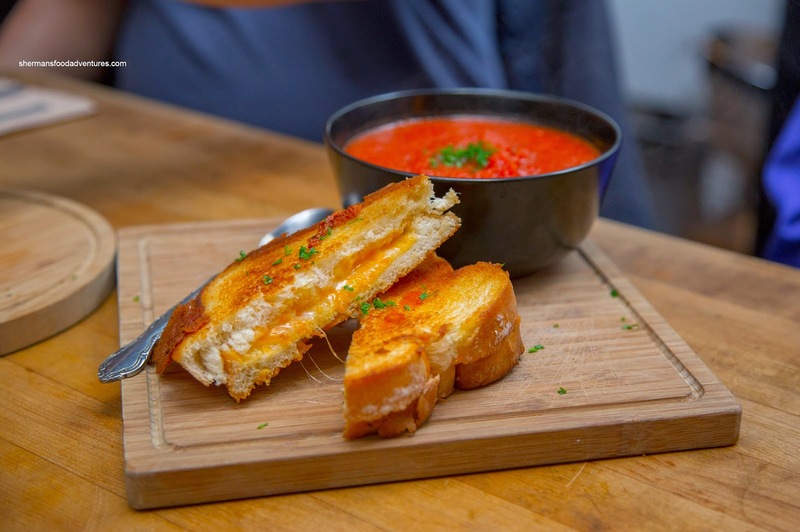 Thick and in a bright red hue, the soup ate more like a sauce with little chunks of fresh tomato. It tasted fresh too with a bright acidity evened-off with an appropriate amount of sweetness. Lionel Hutz ended up with the Fourteen Buck Chuck consisting of a steak burger with caramelized onion, mayo, house relish, onion rings, tomato and red onions with cheddar. 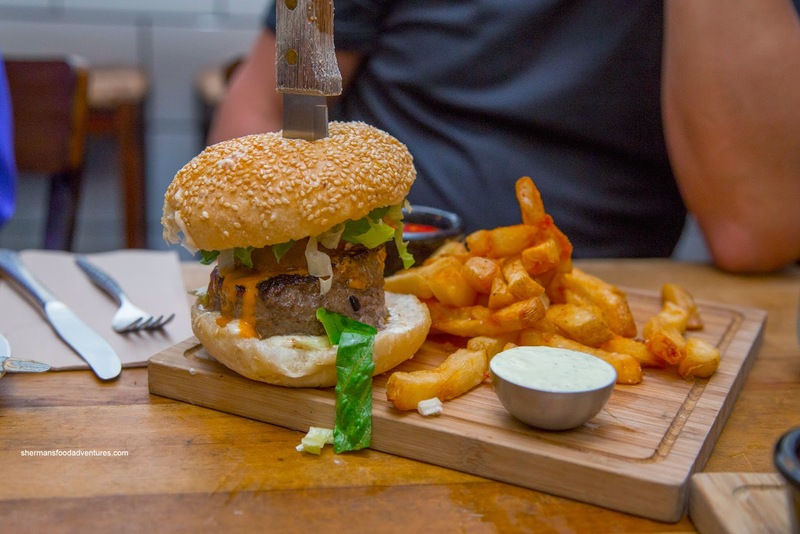 Although the burger looked menacing, the beef patty was not dense. Rather, it was lightly formed where the meat still had texture, but remained moist. The toasted sesame bun was airy, yet held up to the ingredients. 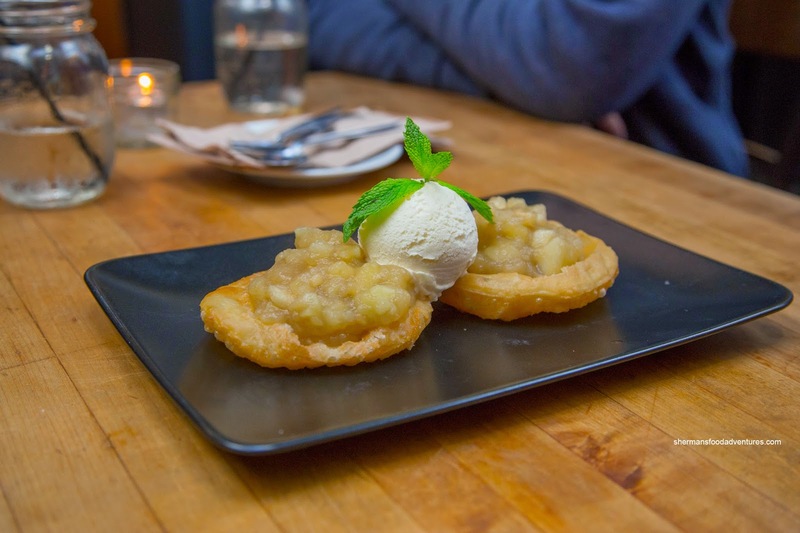 Lastly, with Sweet Tooth around, we couldn't get out of there without trying the Open-Faced Apple Pie with vanilla ice cream. This was a unique take where the "crust" was essentially fried pastry that was light and crispy. It was topped with an apple compote of sorts that featured a noticeable tartness from lemon juice. I found it too tart, but the sweet ice cream did balance it off. As for the apples, they were too mushy for my tastes. If they were more firm, that would've been better texturally. However, looking beyond the dessert, all of the other dishes were appealing and filling at a reasonable price. 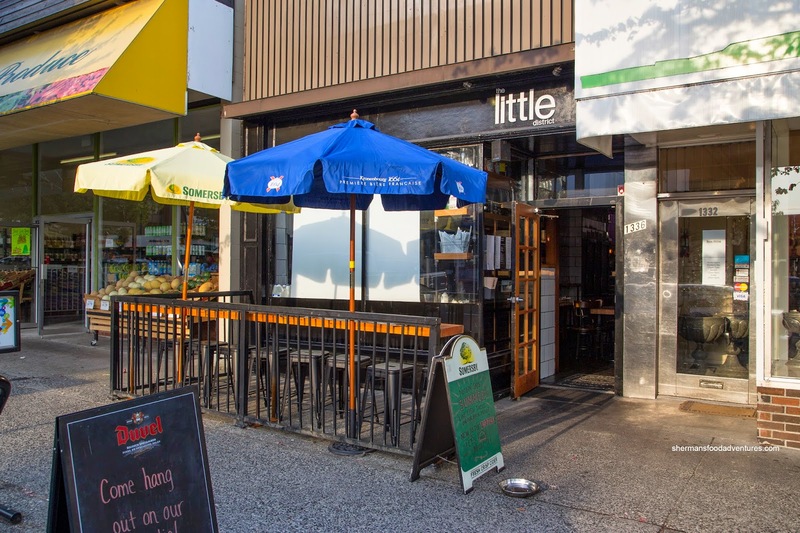 The Little District can easily be missed by even locals, so I guess it is a hidden gem of sorts - one worth discovering.